Life is a play that interweaves scenes of bitterness and sweetness into a long river of life. After experiencing these vicissitudes of life, have you ever felt happiness, that was already like a balloon severed from its string, is beyond your control? At that moment, you could only look up at the night sky and lament: Will I ever experience the ideal life ultimately? Buddha taught us: The law of karma is the key to happiness in life. The present effects of happiness and suffering arise from causes of past virtuous and non-virtuous actions respectively. If we wish for future happiness, we should start from this very moment, adopt [what is virtuous] and cast aside [what is non-virtuous]. If we rejoice our past virtuous actions, these effects could be enhanced. If we repent our past non-virtuous actions, we would have an untroubled life in future. Consequently, Buddha had expounded several teachings on repentance. The later generations of both Han Chinese and Tibetan lineage masters had compiled these teachings into countless rituals. “Emperor Liang Jeweled Repentance” is an excellent representative of these great works. 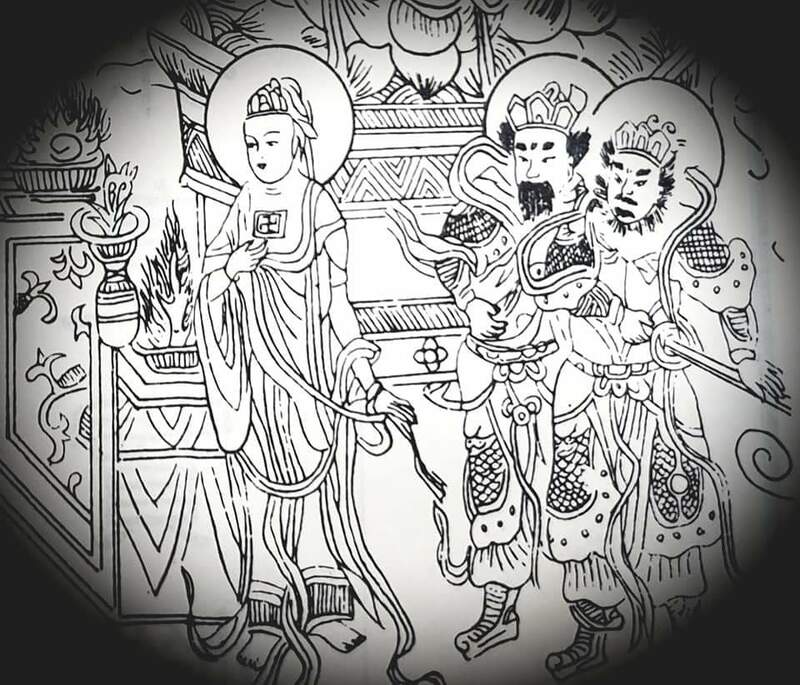 “Emperor Liang Jeweled Repentance” also termed as the “Repentance Dharma of Kindness and Compassion in the Bodhimanda”, was compiled by both Emperor Liang (Wu Di) and his teacher, Master Bao Zhi. Emperor Liang (Wu Di) was an outstanding and eminent Emperor in China history. During his reign, besides being renowned for his several contributions, he also went through short-term renunciation thrice. Furthermore, he banned killing and advocated vegetarianism. Emperor Liang (Wu Di) had strongly impacted the propagation of Buddhism that already existed in China for approximately a millennium. It was fabled that Emperor Liang (Wu Di)’s first Empress Chi Shi, who had a jealous streak, was displeased that the Emperor believed in Buddhism. Not only did she throw and step on Buddhist scriptures on the floor, she also made offerings of raw meat buns to Buddha and the monastic community. She committed many wrongdoings towards the Triple Gem. Nonetheless, her arrogance could not “compete” with her karmic retribution. She passed away at a premature age of 30, and was consequently reborn in the miserable realms as a huge python. As Emperor Liang (Wu Di) could not bear to see Empress Chi suffering in the animal realm, he requested Elder Master Bao Zhi to lead, write and compile the “Emperor Liang Jeweled Repentance”. Master Bao Zhi, also known as a master of Zen, was a renowned elder with supernatural knowledge in that contemporary era. He was ordained at a young age and read extensively on the subject of poetry. As directed by the Emperor, he extracted the essentials from leading Chinese Mahayana scriptures: Lotus Sutra, Avatamsaka Sutra and Prajnaparamita Sutra, and compiled them into these ten scrolls of Repentance practice. The wordings are clear and every sentence is awe-inspiring as well. Though the contents are extensive, they encompass the core teachings of Buddhism, such as, taking refuge, cause and effect, as well as aspirations. If a practitioner is able to contemplate and accords with these teachings, a virtuous mind can be developed effortlessly. It was fabled that following the completion of this Repentance text by Master Bao Zhi, Emperor Liang (Wu Di) had invited all renowned senior monks to the country capital to practice this Repentance together. The altar was magnificently designed. All the lamps on the offering altar were not illuminated. At that moment, there was only Master Bao Zhi at the seat of honour. In everyone’s presence, he announced loudly, “If the Repentance text accords with Buddha’s wish, following our three prostrations, may these lamps be illuminated naturally!” As if on cue, suddenly, all the lamps were illuminated and burning brilliantly. Everyone at the scene exclaimed in admiration. Subsequently, after the completion of the Repentance ceremony, one day, the Emperor could smell a rare fragrance within the palace. He saw an adorned heavenly being appeared before him. He realised that, owing to the collective efforts by the Sangha during the Repentance ceremony, the huge python was liberated and reborn in the Tusita Heaven. The deity came specially to express her heart-felt gratitude to the Emperor. Hence, the great mystical power of this Repentance is incredible. The alias name of this Repentance, “Repentance Dharma of Kindness and Compassion in the Bodhimanda”, was also bestowed by Maitreya Bodhisattva one day in a dream, following the completion of the Repentance ceremony. From here, it could be seen that this Repentance practice/text has Maitreya Bodhisattva’s personal approval! The Praise of Offering is the prologue to every scroll of the Repentance practice. The offerings and praise are all different in each scroll, they are about：incense, flowers, light, water, fruits, tea, food, jewelry, precious items and clothes. These are the prevailing ten offerings in the Chinese Region. Each offering has its significant meaning. By following the graceful praises, we can visualize the offering, praying for the blessings of all Buddhas and Bodhisattvas, for a smooth cultivation of each scroll being recited. This is why we recite the Praise of Offering at the beginning. The Praise of Offering in the first scroll is relatively special. It contains the origin of the repentance verses, process of compiling it, and the story of Empress Chi shi being reborn in Heaven, the scroll inspires the practitioners to have sincere faith. Following that, it is to invite the sage - Samantabhadra bodhisattva to be present to accept our offering, and allowing us to be able to purify our mind and body through our earnest participation. After offering and supplication, then we begin to adjust our intention, that is, why do I need to do repentance? In the Pre-Repentance Prayer, we will pay homage to Buddha and his great qualities, followed by contemplating the cause for sentient beings to be in the cyclic existence, which is all due to the affliction of three poisons. These non-virtuous deeds that are gathered through many life times, are as deep and vast as the ocean. We are unable to escape from the negative effects if we do not repent diligently. (When we) contemplate while following the Prayer, the desire to repent will arise within us. 1st – 2nd scroll: These include (1) Taking refuge in the Three Jewels, (2) eliminate doubts, (3) Repentance, (4) Developing Bodhicitta, (5) Aspiration, (6) Dedication. These marked out the required mentality and correct attitude while repenting, and also how did the non-virtues arise? It cites the causes and conditions on why and how human beings commit non-virtues. 3rd – 6th scroll: These are (7) visible karma fruition, (8) getting out of hell realm, (9) dissolving enmities, revealing the true nature of cause and effects. These scrolls also specially introduced the scenes of the hell realm, causing practitioners to arise fear (to avoid falling into miserable realms), followed by pointing to ignorance being the root of non-virtues, and the way to dissolve enmities. 7th – 10th scroll: They are (10) observation of self, (11) vigilantly rely on the Triple Gem, (12) gratitude towards all beings, (13) making great aspiration, (14-26) Paying homage to the Buddha on behalf of the heavenly realm/deities, kings, parents, monks and nuns, (27-33) paying homage to the Buddha on behalf of the beings in Avici hell, Ash river hell, red hot iron ball hell, hungry ghost realm and animal realm. (34) Making aspiration for the 6 realms of being, (35) vigilantly contemplate on impermanence, (36) pay homage to the Buddha to be able to execute (the aspirations) with strength and power, (37) dedication, (38) way of Bodhisattva’s dedication, (39) making aspiration, (40) Transmission. These 4 scrolls will teach us to rejoice ourselves for being able to meet the Triple Gem directly, and to be grateful to all beings. Therefore, we are to develop great aspirations to help all beings and pay homage to the Buddha on behalf of the four kinds of birth in the six realms. To also dedicate merits for one and all to be able to attain the pure body, speech and mind qualities of the Buddha and Bodhisattvas, and attaining supreme enlightenment! Krakucchanda Buddha and 1000 Buddhas from Sutra of the Names of Three Thousand Buddhas of 3 Kalpas. Why do we prostrate to the Buddhas and Bodhisattvas when we recite the repentance verses? In the Golden Light Sutra, it is mentioned that, if committers of non-virtues, baring their right shoulders, with right knee touching the ground, with folded palms and respect, are impelled to recite with focus, bring to mind and pay homage to all Buddhas of the 10 directions, and all who have attained anuttarā-samyak-saṃbodhi, and also in the Sutra of 4 sets of Practice 《開示四法經》, it mentioned that if one perfects the 4 powers of eradication – power of eradication, power of applying remedy, power of turning away from faults, power of the foundation, one will be able to prevent further ripening of negative karma. When reciting the repentence verses, one is arising the power of eradication, power of turning away from faults, power of foundation in the mind. When paying homage to all Buddhas, and reciting their names, it is already applying remedies. Therefore, the Emperor Liang Jeweled Repentance is a text that is equipped with the 4 powers! After the main repentance is completed, there will be a verse of praise. The first scroll is praising the Bodhisattva at the first level - Stage of Joy attainment. The second scroll is for the second Bodhisattva level – Ground of freedom from defilement, and the third scroll is for the third level of Bodhisattva attainment – stage of emission of light. After completing the 10 scrolls, one would complete paying reverence to each and every Bodhisattva of the ten levels! With these, for every scroll completed, we would have eliminated one huge portion of karmic obstacles, and attaining one section of Dharma-body, where wisdom gradually illuminates till finally attaining perfect Buddhahood! After completing the repentance prayer, we will move on to conclude and make dedication. In this section, we will once again praise the Buddha and Bodhisattvas’ great merits and virtues, recall the key objectives of the repentance prayer, and motivate ourselves to joyously persevere in our cultivation, thus making aspiration and dedication. Praise of Dedication mainly praises and pay respect to Nagapuspa Bodhisattva, that is, to be present at the Nagapuspa Triple Assembly, and receive teachings directly from Maitreya Buddha. Using all the merits accumulated during the repentance prayer, dedicate it towards the time that when Maitreya Bodhisattva attains Buddhahood, may we be able to listen to his discourses directly and gain enlightenment! Repentance practice is like a magical medicine formula; it can turn the negative karma accumulated in limitless times into wonderful virtuous seeds. Hence, when a human life of leisure and opportunity is obtained to practice (the Dharma), one should properly treasure this opportunity, and multiply its benefits!